It is no wonder that planks are becoming more and more popular in flooring design. With square tiles in a variety of measurements offering the classic yet refined standard solution and geometric tiles shaped as waves, hexagons, kites and curves adding completely new creative dimensions, the rectangular planks bring a number of aesthetic options and practical advantages on top. The linear and simplistic style of carpet planks installed in continuation of each other adds a surprising look in playful contradiction to the harder materials such as wood and quarry tiles traditionally made in this longitudinal shape. Planks open up a new, fresh dimension that encourages creativity to redefine flooring design. 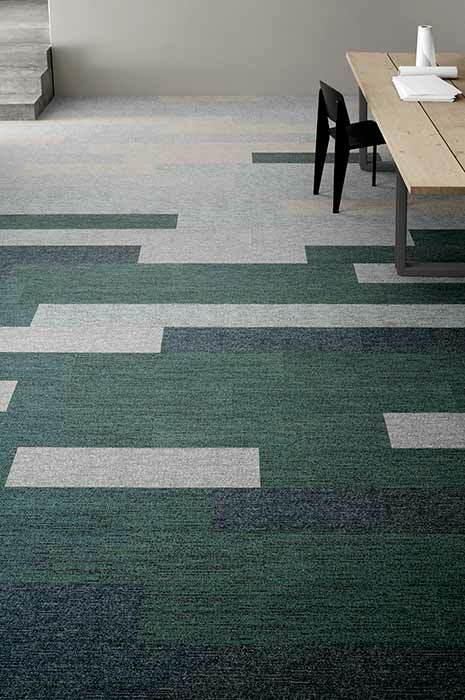 Particularly large patterns such as ReForm Artworks Ecotrust turn out visually pleasing when translated to planks. Danish Østbirkhallen exemplifies this in a three-coloured grey and black selection installed in a strictly designed combination. 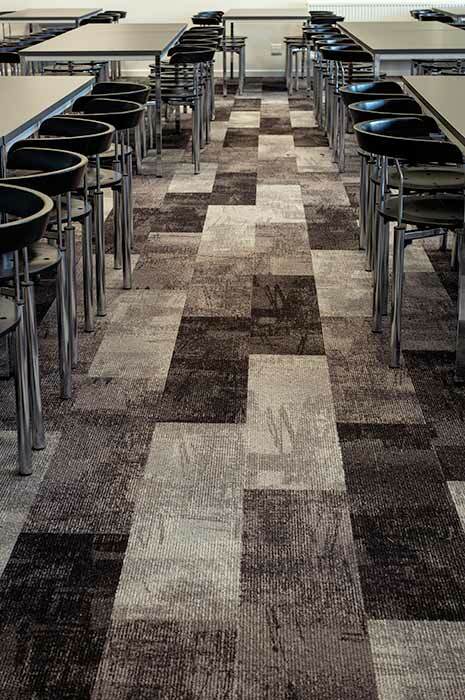 Merging three designs from ReForm Memory Ecotrust, my Parisian ege colleagues make a clear floor scape statement by coordinating various plank designs including one vibrant pattern and colour version elegantly reflecting their beloved and very sophisticated French temper. Do also pay attention to the fluffy and green Soft Dreams Lux rugs customised to match the likewise shaped acoustic wall panels in yellow and beige colours. 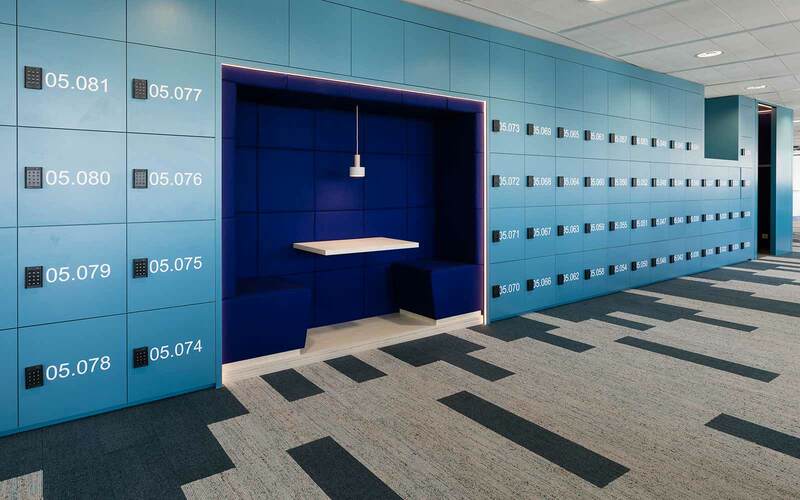 Work station zones are marked with planks featuring dark colours and vibrant patterns. 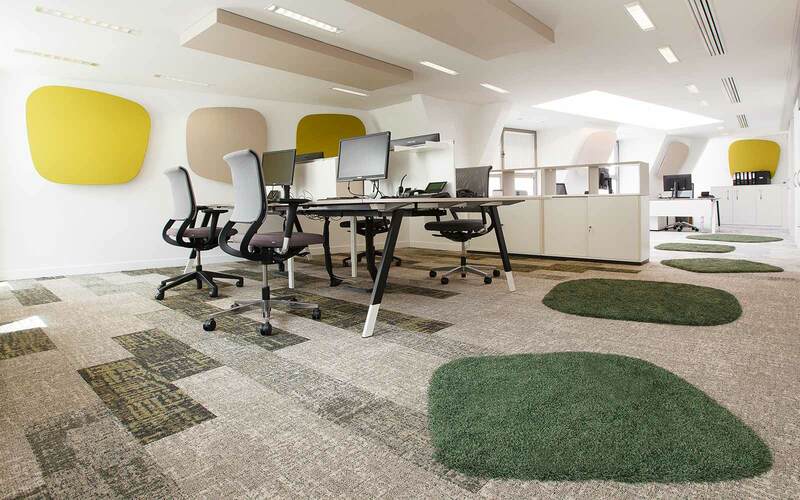 An exciting yet toned down office environment optimising and guiding both energy level and people! Want to take your interior design to the next level? 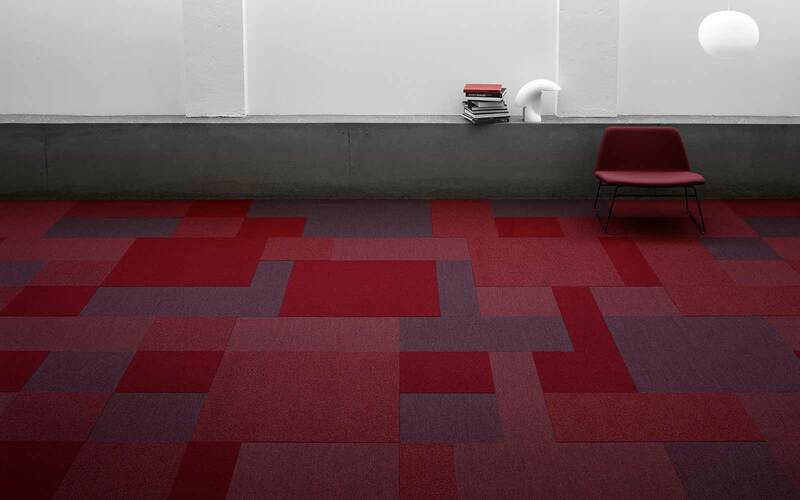 Combine a bold selection of tile constructions, colours, shapes and sizes as visualised below. Building up the surface as an intriguing puzzle makes it subject to endless exploration for the awake guest trying to figure out how all the parts are connected. Mix & match into your own fascinating expressions with depth and structure and experiment with your personal combinations to define areas and focal points. Go bold with powerful colour contrasts, or create a subtle, refined ambience by using different materials in the same colour tone. 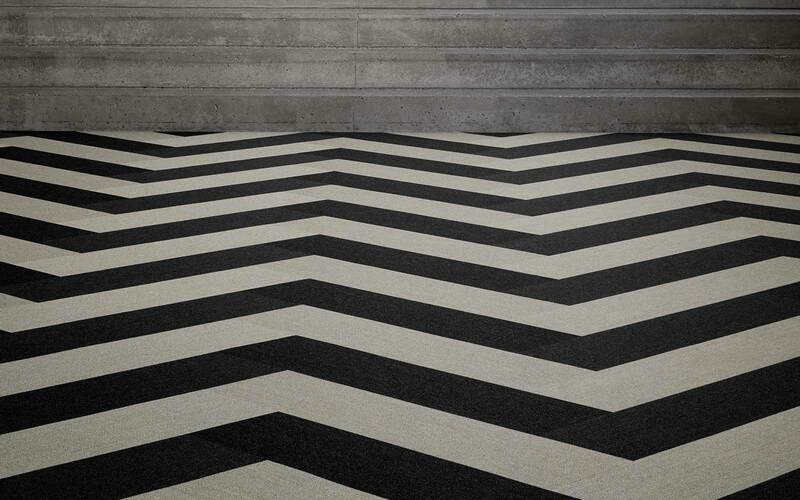 Another impressive effect is achieved through a herringbone pattern creating a very powerful expression based on a quite simple installment technique as shown below. Some architects and interior designers use planks to sparkle up the look of a classic and subdued pattern or colour. When using the plank format to add a surprising touch, the flooring surface is wrapped in a long lasting style that never runs out of fashion in any office setting as illustrated with below examples. French SC Project is fitted with planks from the refined ReForm Legend Ecotrust collection whereas Randers+Radius shows the magnificence of a Highline Express pattern translated to the rectangular shape. When decorating your space with planks, you have an endless number of design options at hand. You can choose between classic tufted, flat woven and shaggy constructions and a myriad of colours translated into two very workable shapes: 24x96 cm and 48x96 cm. Our planks are available in 22 qualities and 450 colours! Split planks elegantly result in almost invisible joints and on top of that, they enable an easy and quick installment. Besides featuring multiple options when it comes to construction, colour, shape and size, all ege planks are fitted with our patented Ecotrust 350 felt backing. An innovative production technique turns used water bottles into a soft, yet strong and highly durable PET felt that also has great acoustic performance. The PET felt is both recycled and regenerable and holds the Cradle to Cradle certification, signifying that it is one of the most environmentally friendly tile backings on the market. Besides that, some of the plank qualities are made from 100% regenerated and regenerable ECONYL® yarn produced from discarded fishing nets and other industrial waste. Thus, you can specify a truly green product without compromising on the aesthetics in any way. 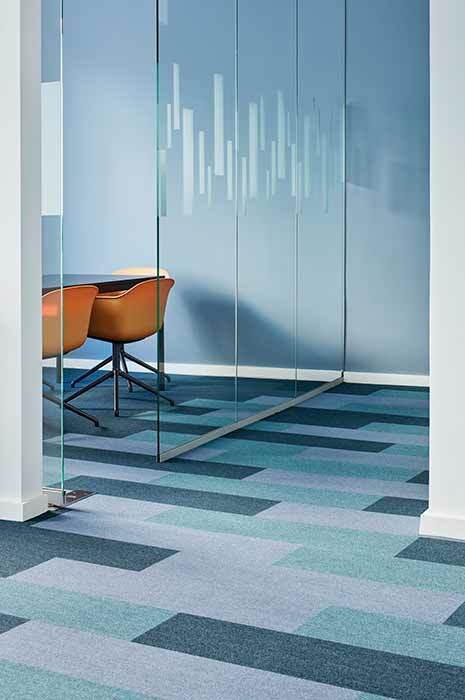 Combining the flexibility and environmental values of carpet tiles with creativity from different materials and colours, planks can deliver head turning designs that match any room and requirement. If you need help creating your tile design, we are with you all the way. We can assist with pattern inspiration and guidance and in some instances layouts made by our in-house design team to ensure that the design fits your wishes and specifications. So please, do reach out for us!